Stop and consider how many people you pass each day — on the highway heading to work, in the hallway, or at the grocery store. Now consider how each of those individuals you pass has a story worth sharing; a passion that ignites their soul and has them eager to learn – an overall thirst for knowledge and exploration. For Dr. Tim Poling, two of his life passions are optometry and research. How Dr. Poling’s path crossed with the Invision team is quite serendipitous. Dr. Poling received his Doctorate in Optometry from Ohio State. Afterwards, he worked for Johnson and Johnson for 20 years in Jacksonville, Florida and Roanoke, Virginia doing clinical research for new products. This position gave him the unique opportunity to travel around the world to places like Australia, Japan and London (where he has traveled to 35 times!) for research purposes. During his travels he visited a number of practices and explained, with confidence, that Invision’s practice is “phenomenal” and among the best he has ever seen. “The staff is great. They really want to take care of patients and make sure they are satisfied,” he shared. “You can see that through the whole practice from the staff and doctors, and it creates for a very good work environment.” Although Dr. Poling is a fill-in doctor for Invision, covering for our full-time doctors while they are out of the office, he honors the Invision brand and provides the best care possible for our patients, making him the perfect addition to our team. However, Dr. Poling doesn’t just fill in for our doctors. He also has his own research practice in Salem where he conducts trials for companies needing new products tested. “The studies are designed to explore information about a new product, while keeping patient safety in mind,” he said. This is where Dr. Poling’s story aligns with ours. When he was looking for office space for his research practice, he got in contact with Dr. Scott Mann. For several years, he rented space in the Invision office to conduct his research, while occasionally filling in as needed for the Invision doctors. However, as he began receiving more equipment for studies he needed more space, and in 2009 he relocated to his own office. Dr. Poling utilizes the knowledge he gains from his research practice and applies it to his work at Invision. Recently, he had to think outside of the box when working with a patient on contact lens fitting. The patient tried two different types of contacts. The problem was he preferred one brand of contact lenses for one eye, and another brand’s lenses for the other. 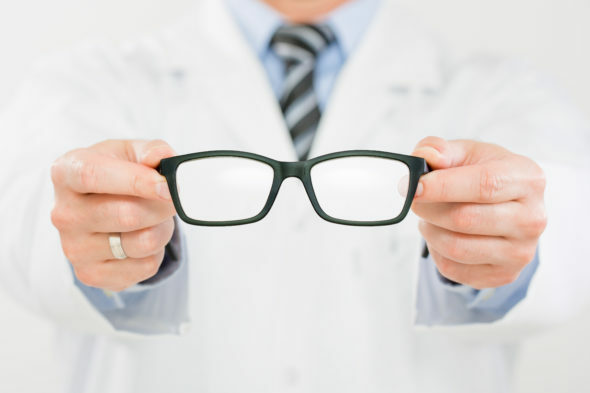 While some doctors may continue trying different lenses that would satisfy both eyes, Dr. Poling explained how the patient could simply do what worked best for him: use one brand lens for one eye, and an alternative brand for the other. His research experience gives Dr. Poling the ability to solve complex problems and come up with the best solutions for patients. Dr. Poling also makes time to give back. He sees patients for the Botetourt Free Clinic at his office in Salem, providing free eye care and serving those in need. While Dr. Poling is a busy man, he makes time to be with his wife and three children, who are his pride and joy. He also lives on a farm; where there is always work to be done! So, next time you are in your car or at the grocery store remember each person has a story and a passion like Dr. Poling, and could be making the world a better place through passions and their profession. We are very fortunate to work alongside Dr. Poling, who serves as a fill-in doctor at both our Salem and Christiansburg location. His research experience and knowledge brings great insight and expertise to our team, while serving our patients with the utmost of care. Previous: The Human Eye, Night Vision and…Frogs?